Some of the figures are significanly taller, as much as 6-9 inches. Some of the figures are just a little taller and made of a harder, darker and glossier material. I have seen others that just have darker skin or different colored hair. The dolls can be marked Anekona Hawaii, Japan, Hong Kong, Taiwan or Korea. The dolls can have the standard expressions but be painted to look like different races. I have see aa HK 3-faced (laughing, crying, pouting) Eskimo doll with molded hair. I have since learned that some of these dolls were manufactured in 1972, by the Imperial Crown Toy Co. I have only seen a few of them with the Imperial markings so if you are searching for them on a sales or auction site, you will usually find them with search engines by looking for their expressions. I have found most of mine by searching for snotty, sassy, bratty, cute or even ugly. 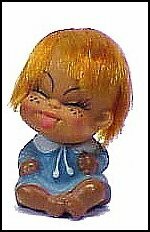 During your searches you will most likely stumble upon an unrelated line of 10-inch expressive dolls called My Pals. If you can find a few of these dolls you will pay very little for them. I've picked up dozens of lots of them all for well under $10 every time.